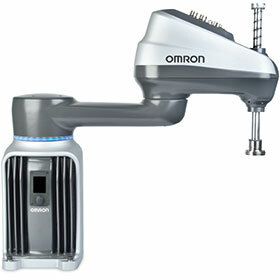 Omron is introducing a new line of Scara robots, boasting a sleek design and enhanced performance. Named the i4, these new generation robots will save space during installation and allow easier configuration into existing production lines. The i4 is fast, repeatable, easy to operate and flexible for multiple configurations and applications. Manufacturers around the world are facing major challenges in having to produce a high mix, low volume of products, together with shorter product lifecycles, while dealing with labour shortage issues. Therefore, manufacturing companies must maintain flexibility in quick changeovers and production line layout changes. They are also challenged by sudden stops, and more than ever need to meet the demands of high accuracy and speed during assembly processes. To meet these challenges, the i4 line features better communication through EtherCAT, enabling synchronisation between other automation devices. This facilitates advanced assembly, inserting and mounting processes that require high accuracy and demanding throughput, as well as ensuring quality control with vision integration. The i4 also visualises working data and supervises its status with the world’s first built-in signals for preventive maintenance, allowing users to mitigate unplanned downtime. • Fast and easy installation: The compact iCS controller is fully integrated into a stylised base, minimising the footprint and wiring required, with no flyover cable, making the i4 effortless to install. It also has the world’s first EtherCAT module design, connected directly on the robot controller and arm, which allows users more flexibility in configuring the equipment. The i4 series runs on interactive software that makes it easier for users to program and use the robots. • No unpredicted downtime: The i4 is the world’s first Scara robot with a built in display designed to simplify troubleshooting and predictive maintenance. The i4 communicates with users to reduce unscheduled downtime, using a light ring and display embedded into the base that indicates which operations to perform at the right times. The light rings are the world’s first robot health lighting indicator, informing users of current modes such as ‘warranty update required’. Manual checks and maintenance plans are no longer necessary. • High speed and high accuracy: The i4 has EtherCAT connectivity, which allows the i4 robots to communicate easily with other equipment in the production line. By synchronising the i4 with Omron devices such as controllers, vision sensors and servo motors, customers can set up the optimal production line with high speed and accuracy. This allows complex assembly tasks that were not possible before. • Satisfying flexibility needs: The i4 Scara family meets a wide range of customer needs, optimising machine cost and overall performance and enabling more flexible line expansions. In 2019, Omron will introduce the first three models: the i4-650, i4-750 and i4-850, which have an arm reach of 650 mm, 750 mm and 850 mm respectively. The payload can hold up to 15 kg, which is three times heavier than before. Customers also have a choice of two different Z-axis strokes (210 mm and 410 mm) for each robot. Special models include the IP65, Clean Room ISO 4 (Class 10), ESD and models that use H1 grease – all meeting the specific needs of various industries and applications. The i4 will also come with an inverted model with the same sophisticated design. The launch of the i4 series is part of a larger Omron strategic concept, the innovative-Automation! initiative, which aims to innovate in the manufacturing environment. By introducing the new Scara family, Omron continues its mission to contribute to labour saving and productivity in the manufacturing industry. Omron’s concept of i-Automation for smart factories comprises the three I’s – i-automation, i-intelligence and i-interactive – and together they facilitate innovation in manufacturing in a smart, connected factory.